Erin Nye still remembers her experiences with Youthfront’s middle school camp and Teen Staff high school program. Some of her best memories as a Teen Staffer involved serving the campers through seemingly trivial tasks like washing dishes or cleaning. 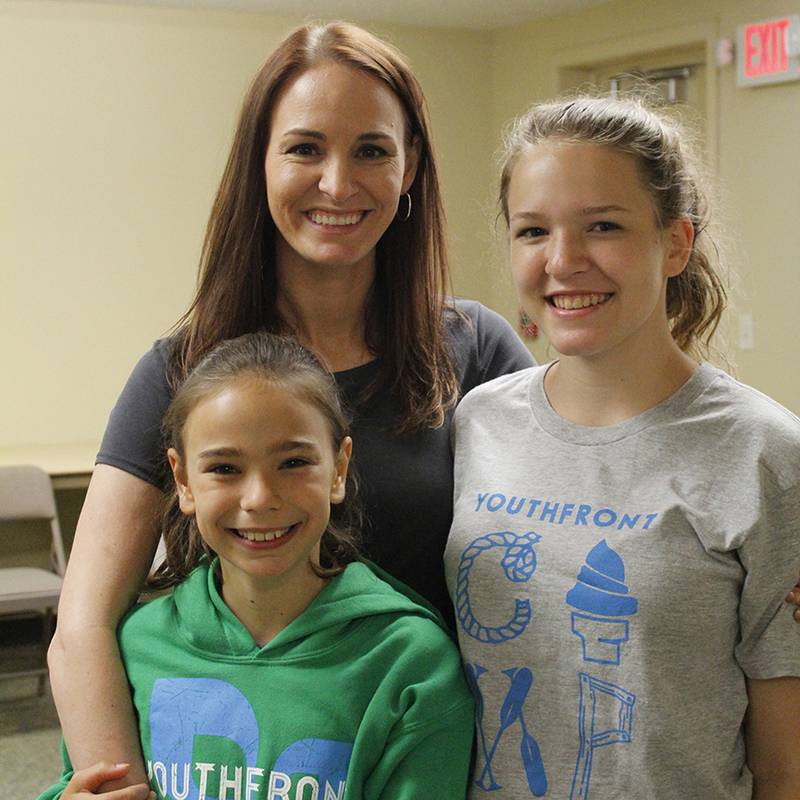 Fast forward to today, Erin has been able to witness the spiritual formation of her two daughters, one of which Teen Staffed for the first time last summer. Both girls have been campers at Youthfront as well. We asked Erin to reflect on her time at camp while also sharing how Youthfront’s ministry can leave a lasting impact on several generations, not just current campers. How did you find out about Youthfront when you were a camper? My youth pastor used to work for Youthfront back when I was in middle school, and so he introduced us to Youthfront Camp. I started going in middle school, went in high school, and then did Teen Staff for about eight weeks over three summers. I really loved it and was so excited for when my kids grew up to be able to let them go to Youthfront. Describe your experience living with fellow campers and Teen Staffers at camp. When I was at camp, I really loved all of the hype and excitement and energy that the cabin leaders had. They just made it fun and I got a lot of one-on-one time with them to talk about my faith. I really grew in my faith being at camp so much. How have you witnessed Youthfront impact your children? The first time my oldest came to Youthfront, she didn’t come with any friends and she was worried about making friends and being alone. But she made friends with everybody in the cabin and she really enjoyed herself, and was crying and giving everybody hugs as she left. And then the next week of camp she brought three friends, and the week after that brought five friends, and then four of those friends did Teen Staff together for the first time. How did Youthfront help you grow in your faith? I really got the chance to separate from my own family to grow in my faith individually here—just having the independence and the opportunity to seek after God on my own. When I camped, I really enjoyed having the challenge of memorizing verses every day, and the time where everyone had quiet time together. And then as a Teen Staffer, coming in, I also didn’t know anybody. I got the opportunity to work in the kitchen, and my nickname that summer was “The Happy Dish Girl”. Me and a couple other friends made some really fun aprons, we would sing a lot, and as the campers would come through, we would get them all excited. We really enjoyed washing dishes and bonding and talking as we did that. What are some of your favorite aspects of Youthfront and why did you want to send your kids here? I really love that they are challenged to be independent in learning about God and then independent on making their own choices. And then, also just really bonding with their cabin leaders, learning about their faith, and seeing someone else’s faith besides their parents’. What is your favorite memory from being a Teen Staffer and a camper? I think my favorite memory was having the time of my life being “The Happy Dish Girl” behind the scenes in the kitchen! Are you a former camper and/or staffer?